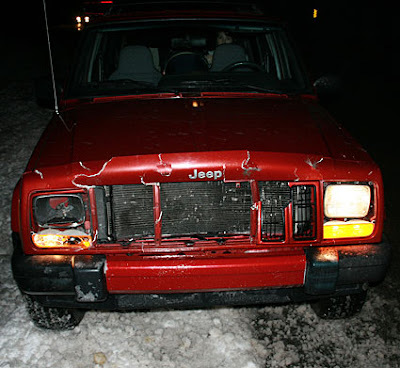 This is what your car would look like if you hit a deer while driving home on a dark, snowy Saturday night. I know this because that's our car. Click here to read Blake's longer, more descriptive account of the accident. Oh I hope everyone was ok! Oh who would have known. Glad you guys were o.k and do you need help with rides or do you have a rental? When will the car be fixed? Darn it! What a way to spoil a really fun night. We sure had fun with you guys at the Pol ex...too bad that had to happen, That must have been really scary but I am glad you are alright!